Looking to cut back or reduce your use of cigarettes, vapes, cannabis or chew? Looking for support to do so? Want to win up to $475?? 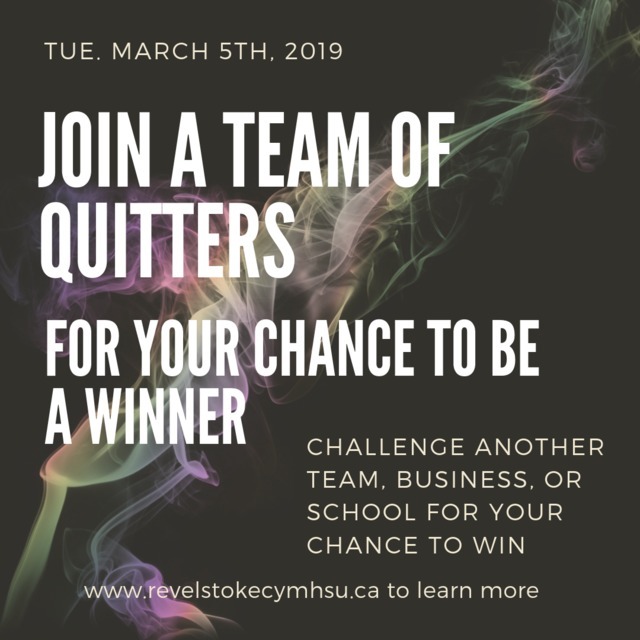 Join the "QuitNow Revelstoke" Facebook group, become a Team Leader, and get people in your workplace, team, or circle of friends to register with QuitNow.ca on or before March 5th for your chance to win. Even if you're not ready to quit, but thinking about it, you can enter to win!! Each team will be given $25 to host coffee or lunch on March 5th and entered into as many as 4 draws to win! revelstokecymhsu@gmail.com to find out more.